I have a Lighthouse to put on Harry's list for him to make in future. Anyone else? 1.Savannah Harbor Light, Georgia - I would assume this would have to be made out of metal. Even though it is small, it is a very interesting light and some of the park stuff could be added to the figurine like the ship anchors ,park benches, bushes, fence and the park history sign. I have 2 choices going from one end of the US to the other and one being totally modern while the other is from the early years of our most western state. My second choice would be the modern Mayport/St. 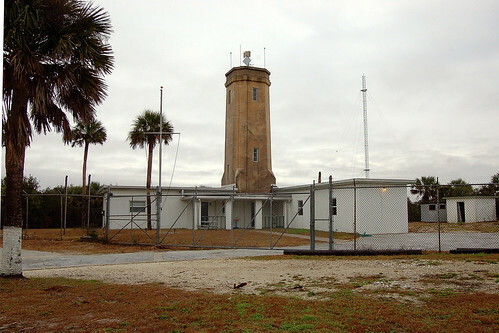 Johns Lighthouse located on the beach on the Mayport Naval Station (not the St. Johns River Lighthouse that Harbour Lights produced). I got to agree with your second choice the Mayport lighthouse. Even though the lighthouse is small the attached building under it is not. This small lighthouses may become a very large lighthouse. This would be a great addition to the other lighthouse associated with Acadia National Park that were previously made by HL consisting of Bass Harbor and Egg Rock lighthouses. My wish list is mostly NJ lighthouses, so I hope at least one is done in the next year. Wishlist: Tinicum Rear Range, Miah Maull Shoal, Finns Point, Bergen Point, Cross Ledge, Romer Shoal, Barnegat Lightship, Liberty Lightship. I would like to see this piece also. Since Tinicum Rear Range and Finns Point were HL Little Lights, they may not be possible from Harry. My top wishes would then be Bergen Point, Miah Maull Shoal, & either the Barnegat Lightship or Liberty Lightship. Sombrero Key (offshore from Marathon, FL). The only Reef Light not made. Cordouan (France, the King of Lighthouses) This one would have to be bigger and we would have to save up for it, but it would be great. Bergen Point, NJ - Gone But Not Forgotten !!! Sandy Neck Lighthouse, Barnstable, MA. Being partial to North Carolina - Old Cape Fear River, Diamond Shoals or Frying Pan Shoals. Getting away from lighthouses, I would like to see a Harry Hine created version of the SS Edmund Fitzgerald. Of course it would have to be scaled down from it 729 foot length but that could be done by having the forward and aft sections with a small inner hull. What would really be the icing on the cake would be a DVD with Gordon Lightfoot singing the Ballad of the Edmund Fitzgerald as part of the package. Oh well, one can only dream about such things! Anybody else want this piece done????? We need more collectors to want this piece and to make a post here so Harry can see if it really would be worth his time to design this piece. An SS Edmund Fitzgerald piece does sound interesting, but since Harry is only doing a couple/few pieces a year I would prefer mostly lighthouses with an occasional lightship. The advantage of the Edmund Fitzgerald is that it would probably sell out in the Great Lakes Area alone rather than New Jersey pieces that are more regional to just the New East Coast area collectors. I'm sure a replica of the SS Edmund Fitzgerald would be popular. I would consider buying it, but I would rather buy lighthouses replicas. My complete wishlist goes well beyond New Jersey lighthouses. The most important thing is that Harry's new line of lighthouses and ships is successful. That way he stays in business. I'm sure if I didn't buy the Edmund Fitzgerald replica, there are many that will. I know a few people who aren't buying the Jones Point piece, but are waiting for the second and third Harry release to see if it perks there interest. Thanks to Gordon Lightfoot, the Fitz has become a legend and is VERY well known throughout the US. That would be the one cargo ship that would be popular outside of the Great Lakes, no doubt about it. Here's another one for Harry. Billingsgate Light. Was on an Island in Cape Cod Bay that has now become a shoal. 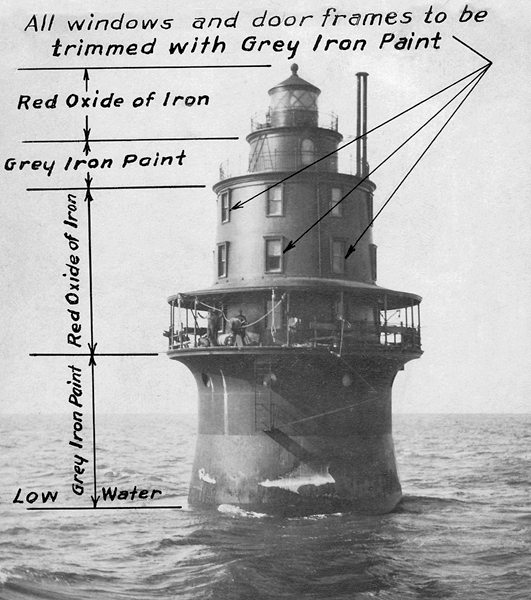 I actually have a copy of the architectural design drawing of this one, (Mayo's Beach Lighthouse, too, which is now Point Montara in California). Here's an image. The disadvantage to not buying the Jones Point Lighthouse when it was first offered is if one of those buyers decides to buy a new piece with Harry's 2nd or 3rd offering they will have to take whatever serial numbers are left (if there are any left at all). By buying the 1st piece (Jones Point) you are at least assured your same serial number on all future pieces. I would be interested. I wonder if Gordon would sign the pieces??? I seconded Sombrero Key Lighthouse. The Shinnecock lighthouse was done back in 2010 or 2011. ??? Shinnecock was a Society piece in 2011. I am a little late in the Edmund Fitzgerald discussion. Internet was down for a while. I would love the Edmund Fitzgerald also, I hear Gordon Lightfoot in my brain every time the word is mentioned. But it is just two big and to make it reasonable in size, it has to be just too small. Remember the prototype HL did. The model that was in reasonable size was the one that was made by another company that had only the front showing while the rest was sinking. I felt that was in bad taste and didn't care for it. I have just gotten a picture of the prototype master mold from the collector that won it at the 2005 Reunion Auction and it is not too large. The actual prototype is only 3" wide and 10" long. How high it is I don't know because the master mold did not have any masts, rigging, etc. I have added some pictures below. The Master Mold Edmund Fitzgerald. 3" wide is pretty small. Maybe double it and make it 6" wide by 20". Then it would look more proportionate with the other HL ships. Yes it will be big, but to show its grandness toward the other HL it would have to be big. To make it small so it wont be to long is like the Hulk not wearing his head scarf or Mr T not wearing his gold. just wouldn't have the effect. Having a model that long would present shipping problems for Harry. UPS charges both by weight and size and something that big would be very expensive to ship. And the cost to make it that long would run up the cost to the collectors who would probably bulk at buying it. It's time to revive this topic since Harry will very shortly be trying to decide on what his next piece will be. I still wish for a Jersey lighthouse, like Bergen Point or Miah Maull Shoal, but will be happy with whatever lighthouse Harry picks. If I can't have the Edmund Fitzgerald or Barbers Point Lighthouse then I will have to lean towards Sombrero Key lighthouse to complete all if the Florida Keys Lighthouses. Savannah Harbor Light is such a simple, yet beautiful light. Maybe he could figure a way to light it and make it look like natural gas . . . .
Lots of nice lights being suggested. I would enjoy seeing any one of them done by Harry. The best chance for me to purchase any of them would be the Florida or New Jersey pieces. Harry has a lot of challenges ahead of him. I certainly hope that he is able to grow his company into a successful enterprise. Harry is continuing his quest for finding a company to produce and paint his future issues. In the meantime he is perfecting his production time of his handmade Toledo Harbor Lens. If you have not order one yet check out Volume 2L of my files to see what it looks like or visit www.harryhine.com to look and place an order for it or his other 2 pieces that are still available. So far this is the lowest production Fresnel that can be purchased and it can be bought for retail. I have many on my wish list, but I love to see Miah Maul Shoal in the near future. Stan - I thought that you gave up collecting after Bill and Nancy sold to Lighthouse Depot?????? Hi Rich, you have me mistaken for someone else. I'm more a "newerbie". I started collecting around the time Bill and Nancy sold HL to Lighthouse Depot. I must have you mistaken with someone else. It's the wandering thoughts of a 75 year old. I didn't know that you were collecting Harry's lights. Did you also get his lens? I've been collecting Harry's new lights. I don't have his lens and the last lighthouse. Daniel - Well, part of it is mowing the lawn, but, I will give that practice up and you can mow my lawn so you will be just like me when you are 75. I hope to be mowing my lawn when I reach 75 !!! If you are older than 70 in Florida the law says you have to hire 'people' to do the lawn, and anything else that is chore-like and happens outdoors in the summer. You are supposed to be doing stuff that brings a smile to your day. Like chasing that one, last, elusive Harbour Lights counter sample to make your collection complete! That doesn't play with my wife's thoughts. Generated in 0.038 seconds in which 0.007 seconds were spent on a total of 16 queries. Zlib compression disabled.